The New York City Department of Environmental Protection (DEP) has started tunneling works on the Delaware Aqueduct Bypass Tunnel—the largest repair project in the 175-year history of New York City’s drinking water supply. The $1bn project will repair two areas of leakage within the 85-mile (136.8km) Delaware Aqueduct, the longest tunnel in the world. The primary leak will be eliminated through the construction of a 2.5-mile (4km), 14-foot (4.2m) diameter bypass tunnel, which will be mostly bored using a 21.6 feet (6.8m) diameter Robbins single shield TBM, 600 feet (182m) below the Hudson River from Newburgh to Wappinger. The tunnelling contractor JV on the project is Kiewit-Shea Constructors (KSC), with McMillen Jacobs (MJ) working as consultant. 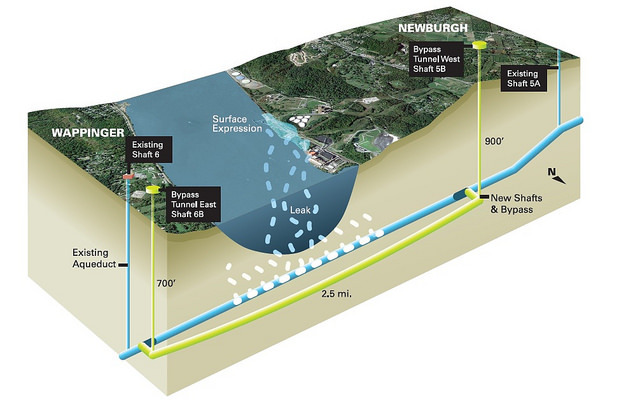 The next phase of construction for the bypass tunnel will begin next week when construction workers in Newburgh begin to lower the $30M TBM into a subsurface chamber located 845 feet (56m) below the ground. The machine is currently being stored in 22 pieces. It will take workers approximately 4 months to assemble the TBM. Once finished, the Bypass Tunnel will be connected to structurally sound portions of the existing Delaware Aqueduct to convey water around the leaking section. The leaking stretch will be plugged and permanently taken out of service. 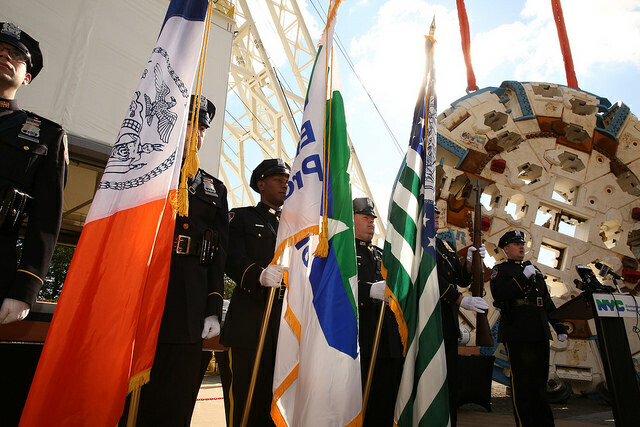 The TBM is a massive and unique piece of equipment. The entire machine—including its cutter head, body and trailing gear—is more than 470 feet (143m) long and weights upwards of 2.7M pounds. The TBM was built to withstand 30 bar of pressure—believed to be the most of any TBM ever manufactured. The machine needs to withstand that much pressure because workers encountered huge inflows of water under immense head pressure when the aqueduct was first built more than 70 years ago. The TBM is also equipped with dewatering equipment to pump 2,500 gallons per minute away from the tunnel as the machine pushes forward. Once the TBM begins work, DEP expects it will drive about 50 feet (15m) of tunnel per day. Work on the tunnel will continue 24 hours a day, five days a week. Tunneling is expected to take 20 months. Over the past several months, workers have already blasted 130 linear feet (40m) of the TBM “starter tunnel”. The finished bypass tunnel will be reinforced by 9,200 linear feet (2,800m) of steel and a second layer of concrete after the TBM is finished driving its path beneath the river. Once those are in place, DEP will shut down the Delaware Aqueduct to connect the bypass tunnel to the existing aqueduct. The approximately 6-month shutdown is planned for October 2022. The project is expected to be finished in 2023.